The annual Heritage Starfest encourages people to enjoy the dark skies of the Colorado Plateau, share the heritage of night skies, and encourage preservation of dark skies. Held each Fall on the darkest weekend in early Fall, enthusiasts converge on Wayne County to celebrate our heritage of dark skies. Telescope viewing, a dark sky run/walk, constellation tours, children’s activities, professional speakers, and campfire storytelling are just a few of the activities. The Entrada Institute is pleased to sponsor educational activities, speakers, and special events associated with this growing festival. 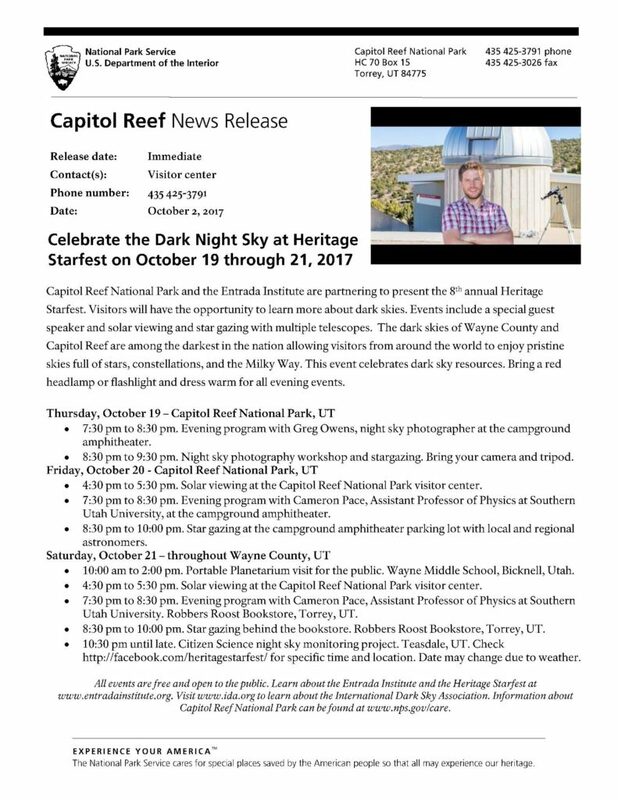 The Entrada Institute and the Capitol Reef National Park are proud co-sponsors of the Heritage Starfest set for Friday October 5 through Saturday October 6, 2018. Wayne County has some of the darkest skies in the continental United States. Come learn more about our beautiful night skies at the annual Heritage Starfest. To learn more, LIKE the Heritage Starfest Facebook page.